Before I can answer, allow me the opportunity to climb to the top of Mount Everest with the world's largest PA system so I can shout �YES� into a microphone loud enough for the whole planet to hear. Yes, this movie is like others, but it could definitely shake a stick at any of those other movies I named. It would be easy to look at Wreck-It Ralph externally�as many already have�and label it as a simple Disney cash-in on the growing video game industry. Once you get inside the theater, though, the level of love and detail in this movie is comparable to any Pixar movie, perhaps even better than some. I'll go ahead and say that I think the endearing short �Paperman� that plays before the film proper, in its 5 minute run, was more emotionally satisfying than Up. Up's problem was that it told a beautiful story in its first 5 minutes then fell into a wholly average, but pretty, kid's movie. I'm not trying to denounce anyone's opinion who liked the movie, but I think it succeeded as well as it did because it had a clear Pixar label on it. 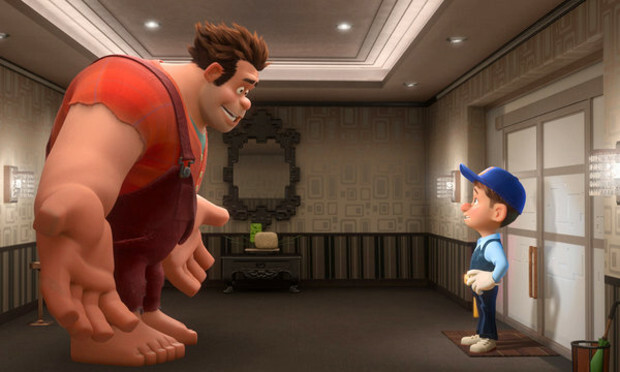 Wreck-It Ralph, though many of its choices were influenced by Pixar, has the stigma of being a sole Disney effort. Since the purpose of this writing is to convince you to go see the movie, I encourage you to look past the Disney label if it bothers you�and if it's any indication of the film's worth, other reviewers have mistakenly confused it for a Pixar movie. And I can't disagree with any of those sentiments. I myself was quoted on the way out of the building saying �This may be one of the most important movies ever made.� I gave myself the night to think about this, let the impression stew, not sharing any opinion until I could consider every angle. So here it is, every angle I could think to examine, and every argument I can muster for why this is one of the most important movies ever made. In case you are unfamiliar with the concept, I will do my best to bring you up to speed. 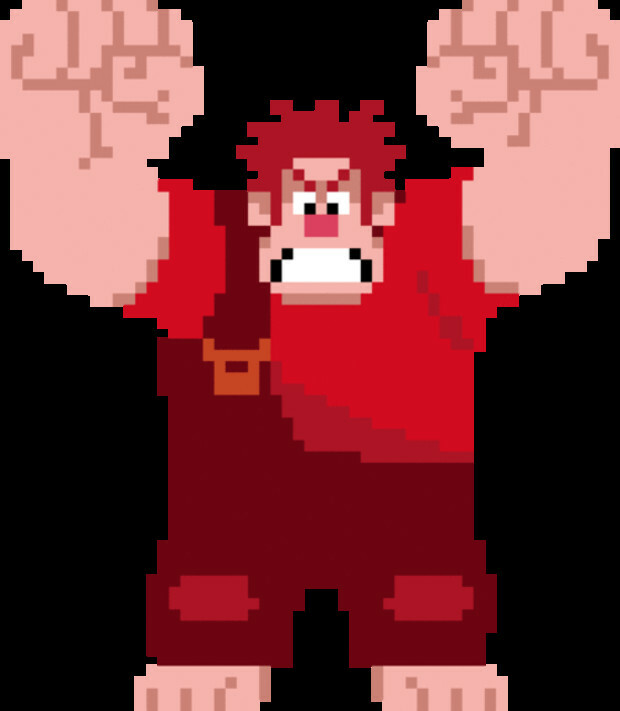 Wreck-It Ralph is the villain of the arcade game Fix-It Felix Jr, who is tired of being the bad guy. He abandons his game in order to get a medal that will earn him the respect of the other guys in his own game. However, his medal is stolen by a little girl named Vanellope in a Mario Kart-esque racing game (complete with an area similar to Rainbow Road), and they must work together to win the big race and get it back. Those are about the most basic terms I can break the movie into, but there is so much more that you just have to see. Most features for children focus on two main characters and perhaps one subplot, but this movie is an absolute marvel in plotting. Ralph's story is self-driven and separate from Vanellope's, which could have easily been its own movie, but the two interweave themselves spectacularly at a certain point of the movie. It's been noted that the movie has a �typical� rise-fall-rise structure, which is true, but this should not be considered a flaw. The general problem of this story structure is that the �fall� comes across as contrived in most movies, and is simply a way to add tension to movies where it would otherwise make more sense to just have the protagonist achieve their damn goal and get us out of the movie 10 minutes faster. But every factor that contributes to the �fall� in this context is done with such sincerity, it evokes not impatience, but legitimate compassion because it asks the question �What do you have to take away from these characters to really break them? And then how do you go about taking that away?� It also helps that the argument the villain makes that leads to this spot of intrigue is actually a very convincing point, making Ralph's motives and subsequent decisions absolutely justifiable. The reason we can appreciate all of these little things is because the exposition itself should be considered a masterpiece in screenwriting. Sure, the film opens with a monologue where Ralph lays (mostly) all of it on the line, yet there is something stilted about his speech, as if he's not speaking to the audience�then of course we discover he's NOT referring to us, but to his villain support group. Natural incorporation of initial given circumstances: Check. The next piece of exposition is in fact a major plot point that seems, at first, nothing more than technical jargon in-universe. This term is later described, and finally fully-fledged, like another whole story. But the impressive part is that this all happens naturally and mostly behind the scenes. One note I'll make is at first, you may be surprised at how mundane Ralph's �problem� seems to be. I know I was. Not being accepted is not a small problem, but the way in which Ralph's frustration comes to light is mostly just sad: he wasn't invited to Fix-It Felix's 30th anniversary in the arcade. What does this say about Ralph and the rest of the movie? A whole lot more than most other animated films do. Most characters in these kinds of movies go through some sort of life-changing event that sends them on a hero's journey of sorts... but Ralph? Ralph's just mad he doesn't get cake (a clever nod to Bowser's continual problem). So what does he do? Blasts cyborg bugs, flies space ships, builds go-karts, initiates prison breaks, and more. What this does is highlight the absolute determinism in Ralph, his utter desperation, which is in many ways shared and overshadowed by Vanellope later. And this makes the dynamic between the two characters one of the most enjoyable and pure friendships in cinema. And let me say in no uncertain terms that, even though I absolutely despise the majority of child characters in fiction (they're all baiting too much for sympathy without doing anything to earn it), Vanellope is adorable, endearing, feisty, and hilarious. And yes, she says childish things, but she's a child after all. Though her backstory prepared her to be independent, once Ralph enters the picture he becomes a father figure, a best friend, or, if you'd prefer this analogy, the Sully to her Boo. And Ralph is the perfect character for her to foil for. Both characters are suited well by top of the line voice acting. John C. Reilly as Ralph does a remarkable job at retaining just enough of his awkward charm while bringing an intense subsidiary melancholy to the character. 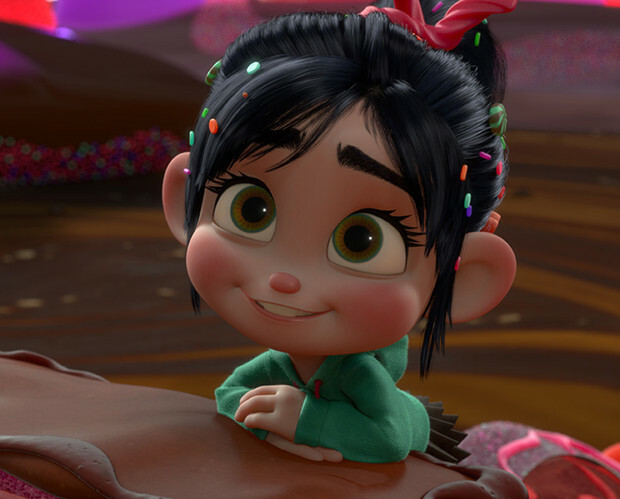 Sarah Silverman's work on Vanellope has so much heart to it, and those I was with commented that this is probably her best voice acting job yet. You'll probably see a lot of Ken in Jack McBrayer's portrayal of Felix, but there's a much more heavily romanticized side to him. And of course, Jane Lynch is nothing but fabulous. These are just the leads, but truly everyone does a wonderful job. And what of the characters they portray? Nothing short of excellent. Ralph is especially a fantastic protagonist, not because he wants to stop being a villain and become a hero, but because he becomes fixated (almost obsessed) with having physical proof that he isn't a bad person as people seem to think. It's deeper than it seems on the surface. Vanellope, as I mentioned, is also incredible, though these two glow especially in their interactions. The �fall� scene is absolutely heartbreaking because of the utter desperation each character shows. Felix may come across at first as a typical goody-good, perfect hero, but later on we see that he has a distinct lack of understanding for the other side, and even has some apparent frustration that he can only fix things (a superb counterbalance that these two are matched together because they are programmed that way, and that for this reason Felix even refers to Ralph as �brother�). Sergeant Calhoun (Jane Lynch, the hard-boiled leader from the in-universe game Hero's Duty), has the quirk of always being on a hunt of some sort as a way to cope with her past. She has a will-they won't-they attraction with Felix that raises some interesting questions about how these video game characters, literally composites of code, can break out of their programming and find romance. The rest of the cast is great too, from big ham King Candy down to the one-off characters like Tapper or (crowd favorite) Beard Papa. These are some of the most charming characters in animated history, due to both the acting and the writing. 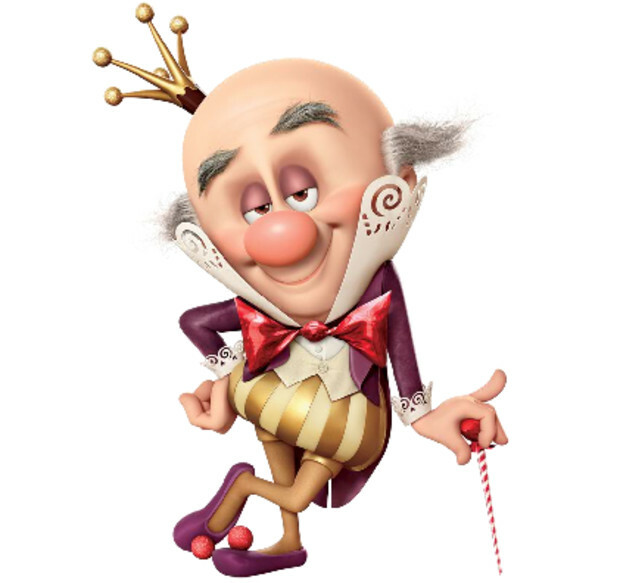 I've heard some complaints about the writing, calling it �typical Disney fare� or �too childish.� Well, yes, there are plenty of jokes that hinge on mocking and imitation which can understandably be appropriated as �childish.� Huh. Almost as if it's a kids movie, you know? Seriously though�they make �duty� jokes and the second half of the movie is almost entirely candy puns, but if you don't laugh at those then the child inside of you is probably dead and gone. Most people will laugh at the word �duty� in a group of friends, and yet call it cheap when it's used in a movie. And some of the puns may illicit groans, but that in itself is a funny thing. There's an improvisational comedy game called 185 where the whole point is to make crappy puns that make the audience collectively groan. It's not necessarily the pun itself that is funny, it's the recognition of the word play and following realization that everyone else in the audience is groaning that makes it funny. I respect Wreck-It Ralph for not being afraid to write their characters like this. That's what I call committed writing. With all of this greatness, can there possibly be room for any more? Of course, silly reader! Wreck-It Ralph is a gift that keeps on giving. The visuals and the soundtrack are no exception. The term visual feast gets tossed around a lot, but hardly is it more appropriate than in this movie where 75% of the movie is looking at a world that literally is a candy buffet. When you're not looking at a chocolate and candy cane atmosphere, you'll also get the gritty dark and neon world of Hero's Duty, and the minimalistic (but cute) world of Fix-It Felix Jr, among dozens of little flashes that show the 8-bit representations of the games you're watching. There's a tumblr called moviebarcode that condenses all the frames of a movie into a small little rectangle so you can get an idea of the film's color scheme�I'd like to see a bar code of Wreck-It Ralph for all of its aesthetically fulfilling contrasts. And of course the score harkens back to the 8-bit days with electronic instrumentation scored into little �themes� as if for levels. And the credits song for Wreck-It Ralph is perfectly 80s in its sound. It's all of these little things that come together in a perfect harmony that really attest to the excruciating detail in the film. It's been noted by several reviewers (as it was with Scott Pilgrim before it) that it would take many, many viewings (of which I am already planning more) to catch every little reference or allusion in the background. The movie had so much affection put into it that it practically oozes the stuff�and that alone puts this movie on a shelf with some of the best Pixars. They make the viewer be attentive, but not straining, to absorb everything it has to offer. And that is what really makes you think while you watch it. I know I thought a lot. I thought about the nature of video games, video game movies, and popular culture in general. You see, even though retro gaming has certainly had its resurgence in the past couple of years, I found it strange for awhile that Scott Pilgrim and Wreck-It Ralph would root themselves in that specific branch of gaming while Call of Duty and God of War are the hip new things. For Scott Pilgrim, despite its acclaim, it wasn't enough, and failed to bring in a large audience. Wreck-It Ralph has a bit of a leg up. It's Disney, it has a world inspired by Halo, and it generally has a broader appeal. I thought about why this is and I think for the most part, it's because it perfectly matched material with target audience. It's perfectly tailored for kids because even though they may not �get� some of the more obscure characters, they can follow the story and focus on those that they do know�Bowser casually sipping coffee, Sonic delivering a PSA, and Pac Man wobba-wobbaing around Felix's penthouse are all going to draw their attention. Meanwhile, their parents, who were kids when these games were popular, have the added parental bonus of picking up on all the smaller stuff. I think those two age groups are best suited, but I think it has a pretty universal appeal for the sake of just telling a very good story with characters deserving of instant classic status. I think it may alienate some teenagers, who may have �cooler things to do,� but even they get shoutouts to their age group: good ol' Skrillex shows up as a cyber DJ, and later you can catch a glimpse of Leroy Jenkins graffiti. So the video game aesthetic is clearly a good choice as it establishes an audience, but the setting accomplishes something even more than that. It's widely accepted as fact that video game movies are lame. From the Super Mario Bros movie to Street Fighter to Street Fighter: The Legend of Chun Li, all have been met with derision and disregard, even if some later achieved cult status. Many called Scott Pilgrim the first great video game movie despite not being based on a video game, but now we have this to take the throne. Though it is not based on any preexisting game, one might consider it as such since there is a Fit-It Felix game that was released before the movie (and is a lot of fun!). What I'm getting at is it's not a format that (until this release) was explicitly tackled in the mainstream media with any kind of success. 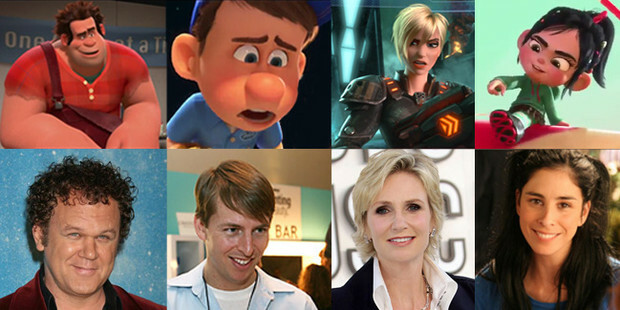 But with Wreck-It Ralph we have something good that presents all the potential of video game movies. The video game movie format does something new: it completely recasts tropes that we've become accustomed to over the years. It doesn't have to deal with a messy backstory for Sergeant Calhoun because they pass it off as just being in her programming. In another movie her depressing backstory would be seen as �Oh, they just wanted to make us feel sympathy for her.� But in this one, it's not even a real event that happened�it's a memory that was programmed into her. And it's not the memory that shapes her character. The memory is the programmer's excuse for the character. This is why her flashbacks are so hyperbolized. It's simultaneously humorous, explanatory, and gives her character some depth. It should come as no surprise that a video game movie could rewrite tropes like this, because that's what video games did when they first came out. It was a completely new medium with new things to say and new ways to say them. With this movie, a whole new spectrum of explanations and plot devices is now available to filmmakers based on the way that video games and movies function separately. For example, final confrontations in movies and games are different. In a game, defeating the bad guy is a heavily personal experience as you fight the guy who has single-handedly oppressed you. In a movie there's a distinct separation. But in Wreck-It Ralph as soon as the villain identifies himself as �the final boss� I know I for one clicked into personal mode. This villain became Bowser, Eggman, Wily, and Ganon, and it was on. It hit a personal chord with me. It's rather impossible to not appreciate that. Other themes arise all over the place... themes of acceptance, destiny, even possible suggestions of disability-as-a-superpower with Vanellope's glitch. It's all something that you should explore for yourself with an open mind, ready to let out your inner child. At its worst it's a frenetic, high octane thrill ride with breathtaking visuals, a nostalgic soundtrack, stunning detail work, pitch-perfect characters, and a great sense of humor. At its best its an emotionally driven work of art that redefines what a movie can be. I stand by what I said. This is one of the most important movies ever made.